A new medication called Radicava (edaravone) was approved in May 2017 for the treatment of amyotrophic lateral sclerosis (ALS). It was approved in Japan before it was approved in the United States. This is a significant development because it is the first FDA approved drug for ALS in over 20 years. ALS is a neurological disease that causes weakness of the muscles and rapidly worsens, resulting in complete paralysis over the course of only a few years. Early symptoms include mild weakness and subtle twitching that may involve the arms, legs, face or tongue. Radicava is one of the few available treatments for ALS, which is one of the reasons that this medication is so important. Since ALS is disabling, slowing down or stopping the disease could potentially reduce disability and prolong the lives of those living with it. Radicava is believed to protect against the worsening of ALS by working as an antioxidant. Antioxidants prevent a type of damage to the body known as oxidative damage. Individuals with ALS have been found to have evidence of more oxidative damage than those without ALS, which may be at least partially responsible for the disease. In Japan, a six-month trial of Radicava showed that ALS participants who took the drug experienced slower worsening of their daily functioning than ALS participants who did not take Radicava. How Do You Use Radicava? Radicava is taken through an intravenous infusion (IV) and has to be given by a healthcare professional. The infusion lasts for approximately an hour and is taken daily for 14 days in a row, followed by a 14-day break. After the first 28-day cycle, the infusion cycles are repeated by taking Radicava for 10 days of the first 14 days of the cycle, followed again by a 14-day break. The most common side effects of Radicava include bruising and trouble walking. While it does not appear to be a common side effect, Radicava may also cause allergic reactions such as hives and trouble breathing. Experiencing side effects when taking a drug that's supposed to be helpful is understandably frustrating. Before opting for this treatment, be sure to discuss the risk of these side effects with your doctor to understand how they may affect your specific situation and how to best cope with them. When deciding if Radicava is for you, it's important to consider other available treatment options. Unfortunately, there are very few medications available for people who are living with ALS. A medication called Riluzol was approved in 1996. This medication is believed to work by decreasing the action of a chemical called glutamic acid, which is known to over stimulate the nervous system, potentially causing permanent damage to the nerves. 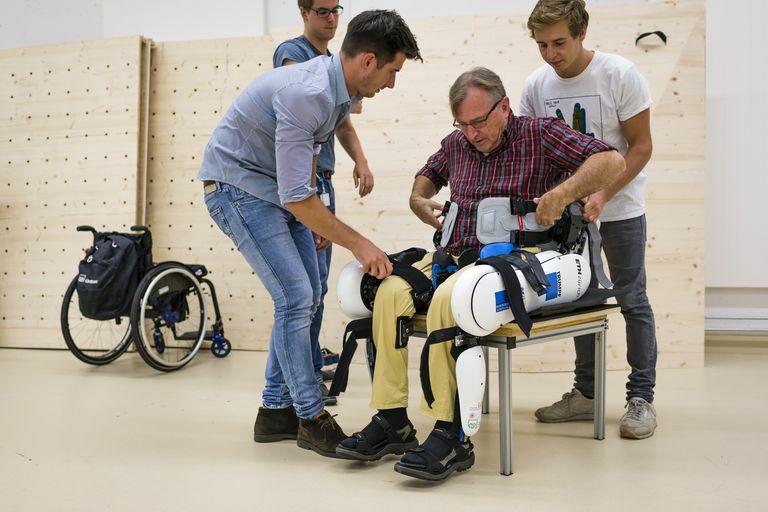 The other medical treatments for ALS are directed towards managing symptoms as they come up, and are not effective in slowing down or stopping the disease. For example, pain medications and medications that decrease discomfort caused by muscles stiffness may be used when you experience pain or muscle stiffness. Similarly, medical devices such as supportive muscles braces, wheelchairs, and feeding tubes can help make your life easier with ALS, but cannot reverse or stop the disease itself. Living with advanced ALS means that people suffer from complete weakness of your arms, legs, body and face, while still being able to think, feel, see, hear, and move their eyes. In advanced stages, many are not able to speak, chew, or swallow food due to weakness of the muscles that control the face and mouth movements. Communication, however, is possible when you have ALS, because you can understand others and you can also use techniques, such as computerized technology, to communicate. Typically, ALS leads to severe disability and even death within a few years of the first onset of symptoms. A treatment that slows down this progression is promising. Discussing the benefits of it for your situation with your doctor is best. According to the Centers for Disease Control and Prevention (CDC), about 12,000-15, 000 Americans are currently living with ALS, making it relatively uncommon, but still extremely important to each and every person who is afflicted with ALS, as well as to loved ones and friends. The approval of Radicava for treatment of ALS is promising. The recent surge in awareness of the disease, a lot of it through the ice bucket challenge, may result in even further scientific developments in the future. In the meantime, those with ALS might benefit from joining a support group or even learning about whether they would want to participate in experimental treatment as research continues in this area. Nagase M, et al. Increased oxidative stress in patients with amyotrophic lateral sclerosis and the effect of edaravone administration. Redox Rep. 2016 May;21(3):104-12. US Department of Health and Human Services. FDA Approves Drug to Treat ALS. 2017.